Every high-rise building breathes. Air moves in and out and up and down. It is very important fire personnel responding to events in high-rises understand where the air is going. Doing so allows the incident commander to have a better idea where the smoke and toxic gases may also be going. If you comprehend how a building behaves and breathes, you can also have a firmer grasp on where your problem areas are going to be – and where the danger zones exist within the confines of the building. You can literally predict where the smoke is most likely to go and in turn, where you should dedicate your resources to address those problem areas sometimes even before they begin to expose themselves. Potential casualty counts can be minimized or even avoided just by knowing how the building will be acting during the fire. Staying ahead of the game and not allowing yourself to be placed in a position of having to play catch-up is vital to the successful outcome of a serious fire. Understand your theater of operations. Air balancing is directly associated with the concept of stack effect, (see April 2008 Firehouse). However, air movement within a building is so important that it is a topic that must be re-visited and expounded upon. We already know that with stack effect, the temperature and pressure differentials between outside air and inside air will dictate where the air currents will flow (horizontally and vertically) – and where smoke is likely to follow. We know in cold weather that air is rushing up into the tower from the bottom of the building and out onto upper floors. Whereas in warm weather, the reverse is true: air is rushing down through the tower and out of the bottom. In cold weather, fires in high-rises act completely differently than they do in warm weather. What causes this flow of air to occur within the building relative to temperature and pressure? The answer is the “Air Balance.” Let us more closely examine this unique phenomena and why fire departments must understand it. Since it is easier to explain as it applies to high-rise commercial buildings that are modern and use a “sealed envelope” approach to energy conservation, we will break that occupancy type down and explain everything in greater detail. With newer buildings, windows do not open and the curtain wall wraps the building up in a protective envelope, which allows for more cost-effective heating and cooling costs. However, the windows and wall systems are very rarely tightly sealed. Because of wind pressure and/or thermal air differences, the air squeezes in around tiny cracks that exist on each floor’s exterior that are under slight negative pressure (the bottom half of the building in the winter/the top half in the summer), and is drawn into the core penetrations due to a greater negative pressure and pulled up (or down – summer) to floors that are not under negative pressure, then pushed back out onto those floors via the now greater positive pressure which exists in the core after the current of air has passed the “Neutral Pressure Plane”, or NPP, thus pressurizing those upper/lower floors to a positive nature. The combined wind pressure and thermal differential may shift the NPP in the building. The negative pressure range of the building “pulls” the air into the building and in the positive pressure range, the air discharges or “leaks” to the outside from every high-rise building. When significant wind pressure is involved, it superimposes on the thermal balance of the NPP and “shifts” it (depending upon leakage rates). The 3rd impact of NPP shift is the building pressurization by mechanical HVAC (Heating, Ventilating and Air Conditioning) systems when more outside air is brought into the building than there is exhausted to the outside. Most buildings are slightly pressurized (“bias”) by the HVAC systems to reduce cold air infiltration, particularly in wintertime, which would affect the comfort conditions of occupants at the building perimeter zones. The building pressurization by HVAC systems is usually more significant than the thermal stack effect in moving the NPP and it is intentionally high to prevent the inrush of cold air into the ground floor entrance through lobbies and into elevator shafts (“whistling” doors) and stairwells. In highly pressurized buildings the surplus of outside air assists in pushing the thermal stack effect air back to the lower levels in the building and thus the NPP has mechanically been shifted downward in the building. From the aforementioned, it should be clear that the air balance and NPP of a building shifts up or down from the theoretical neutral pressure plane midpoint in the building when air is moving horizontally as a result of wind pressure and through leakage on nearly every floor. It also occurs vertically as a result of stack effect and mechanical air pressurization. The neutral pressure plane is typically found for about 1-3 floors, depending on the height of the building. There is virtually little to no air exchange in and out of vertical shafts in that area, therefore it is deemed to be “neutral”. It is under neither positive nor negative influences. On floors above and below this zone, air is rushing in and out of the elevator shafts and stairwells due to temperature and pressure imbalances. The further removed floors are from the NPP, the greater the differential air pressure is relative to the outside and thus the velocity of air movement onto and off of building floors. In cold weather (see figure 1) the air is being drawn into the building through unsealed cracks at windows and spandrel panels on each floor as well as through lobby entrances with revolving doors and swinging doors (and even loading docks). This is why when you enter a high-rise building through a lobby swinging door, you instantly feel a rush of air going past you into the building as the door is pulled open – this is “make-up air” as a result of differential thermal pressures entering the “chimney” (the building). In cold weather, air is sucked into the core due to negative pressure existent on all floors below the NPP, whereas on floors above that zone it is pushed out of the core due to a positive pressure influence. The infiltration and exfiltration and air movement is relatively low just above and below the NPP and is much greater at the top and bottom of the tower. The air travels up above the NPP and is pushed out of upper floor curtain wall openings and roof access doors, elevator machinery penthouses, etc. The greater the differential pressure (outside vs inside) caused by the three influences (thermal/stack, wind pressure and building pressurization), the higher the rate of air movement, leakage and effect on the vertical location of the NPP within a building. This also explains why super tall high rise buildings experience such severe stack effect problems, while a typical 10 story building does not - the taller the tower, the greater the air intake and discharge due to the significant height involved and floors distant from the NPP. Positive stack effect will be present in cold weather, negative stack effect in warm weather – the higher the building, the more pronounced its effects. The temperature difference between inside and outside, in addition to the height of a building, play a major role. For example, if it is 34°F outside on a cold winter day and it is 74°F inside a high-rise building, then there is a 40 degree temperature differential. It can be expected that there will be a significant positive vertical stack effect taking place within the core penetrations with air channeling up and onto floors above the NPP, while negative pressure influences exist in the bottom half of the tower that allows the draw of “make-up air” to be pulled into the building to replace the warm air that is rising upward. The air (and smoke) being sucked into the stairwells is, of course, going to be drawn up to the NPP (located roughly midway up the building) and discharged beyond the NPP onto occupied floors many levels above the actual fire area, thereby increasing the life threat to occupants who may be performing a "defend-in-place" posture as directed by fire command. If one or both stair exit doors (in a 2-stair core configuration) are not closing behind fleeing tenants (no stairwell pressurization), then this ensures the fire will also be drawn towards these openings, as the negative partial pressure of the shaftway will pull the fire and smoke towards it. Fire and smoke take the path of least resistance. Compromising one or both stairs on the fire floor with this situation presented here would essentially turn both stair shafts into smoke towers and greatly endanger the people on upper floors staying put or descending down the stairs from above. Even though the attack has to be mounted through one of the stair openings, the other stair door must be verified to be closed by fire personnel (unless search teams are passing through it). Thinking through this equation with tall buildings, stair doors on lower floors would easily be pulled into the open position and may not close without human assistance, while doors at the very upper floors will be fairly hard to open for tenants choosing to leave their floors since the strong air currents caused by positive pressure will be pushing against the doors at these levels (unless stairwell pressure relief dampers are present and functioning). Fortunately, stair pressurization in modern buildings will tend to minimize this effect once it is activated by the automated alarm system (or manually at the lobby FCC – or created via fire department fans). One of history’s most prominent examples of cold/winter stack effect was the 1993 bombing of the World Trade Center in New York. It occurred in February, with an outside air temperature of 37°F and light snow flurries falling from the sky. The temperature inside the towers was approximately 75°F. It was reported 4 ½ minutes after detonation on the B2 (Basement 2) level in a nearby parking area, there was heavy smoke conditions on the 110th floor of Tower 1, due to the bomb blast exposing the base of the elevator and stair shafts. How did the smoke travel so far vertically so fast, approximately 1400’ in less than five minutes? Stack effect. It could not be controlled that day by first responders because of the effects of the vehicle bomb, but IT CAN BE controlled to a great degree in typical high-rise fires by minimizing the time lobby entrance doors (and external exit stair discharge doors if present) are opened. Keep the “dampers” (street level doors) to the “flues” (core shafts) within the “chimney” (the building) closed as much as absolutely possible (see figure 2). At this event, misguided media advised people to break windows on upper floors for fresh air (when, in fact, all but the top-most floors were only slightly affected by smoke that truly impeded breathing). This just further exacerbated the situation, as it provided a more efficient discharge point for the stack effect on floors well above the NPP where the outgoing pressure from core poke-throughs is greatest. It also did not help the cause with the elevators that served the lobby being automatically recalled to lobby level and self-opening their doors which created a more efficient intake point for the “make-up air” being drawn into these same shafts at the base of the “chimney” – 110 stories tall. How many fire ground commanders would be contemplating this threat from stack effect as part of their high-rise SOP checklist? Why is it not in every high-rise SOP that efforts need to be made to attempt to control the stack effect in these type fires? How does the air get into and out of the shaftways within the core of a building? The same reason why it squeezes through unsealed or improperly sealed details of the curtain wall (and lobby entrance doors). Air moves around stairwell doors and elevator hoistway landing doors at a higher rate than one might imagine. 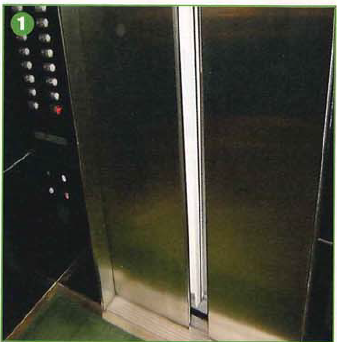 The better the elevator and stairwell door seals, the less potential for vertical air movement as a result of stack effect. Even poor fire stopping on core poke-throughs (cable risers, etc) can feed the vertical air flow going up or down within the core area. Another side concern of stack effect in buildings in cold climates, is the winter air drawn into the building through curtain wall leakage below the NPP into the ceiling plenum area near the curtain wall which in countless cases has resulted in freezing and bursting of fire protection branch lines, as well as piping systems supplying heating coils of perimeter fan-powered Variable Air Volume (VAV) boxes or fan coils. The freezing cold air being sucked into the base of the tower may present freeze-up problems for building owners and firefighters alike should sprinkler branch lines freeze and possibly burst as they do not contain anti-freeze additives. As noted, at the World Trade Center complex in New York during the 1993 bombing, numerous windows were broken during the fire. Despite sprinkler piping being insulated within 10 feet of the perimeter, freezing/bursting of these lines were a very valid concern in this mid-winter incident after Con-Ed shut down the steam service to perform necessary testing, which took a week. With the heat now down amid freezing temperatures and despite the loss of 300 windows, the management of the complex did not freeze up even one sprinkler line – how? They turned on all the fluorescent lights on all floors once power was restored in the evening on the day of the bombing, which created enough ambient heat to prevent another crisis within a crisis. Sometimes ingenuity proves its value in Aces. In warm weather, outside air is drawn into the air conditioned building on the upper floors (due to negative pressure influences by the dense cool air descending) where it is quickly cooled by the HVAC system, pulled downward and discharged onto lower floors, with the greatest “release” occurring on the lower-most floors and lobby level (see figure 3). This is why when you enter a lobby through a swinging door in the summer (or warm winter day), you feel cool air rush past you LEAVING the building – the opposite of what was described earlier during cold weather entrances when it rushes past you ENTERING the building. The natural flow of air is important to note, because it dictates where smoke will travel. Also, as previously noted regarding the stair doors on lower floors possibly not closing behind fleeing tenants as air enters these shafts, unbeknownst to the Command Post, the opposite can be true at the lobby level during warm weather fires. Lobby doors may very well not be closing behind people leaving the building or firefighters entering it (see photo 3). Allowing this open channel for air to escape the tower will draw smoke downward and further enhance the stack effect, as this opening becomes a notable “release point” for the negative draft. Read on to learn why this is so important to be aware of. I mentioned in a recent article on Rapid Ascent Teams (see Part 1 and 2 – March/May 2011 Firehouse) that the tracking of CO must be a part of the overall scope of the Incident Command process on high-rise fires. Tracking CO above the fire and noting floor intervals where it may be collecting is vital to understanding where areas of great danger might exist for fleeing tenants or tenants performing a "defend-in-place" procedure dictated by the IC Post when it is deemed unnecessary for upper floors to evacuate. One thing I chose to leave out of that article to avoid venturing off into a highly technical topic is the process that takes place below the fire floor in warm weather fires. Firefighters and command officers tend to mostly focus on what is happening at and above the fire floor. However, we must examine what is taking place below the fire floor as well. With an understanding of the air balance, NPP and air movement above the fire floor(s), we should ask ourselves the question – what happens in high-rise buildings below the fire floor in hot weather? Knowing in cold weather that a positive stack effect is taking place where air is rushing in at the bottom of the tower, up past the NPP and back out on floors above, what is taking place when a fire strikes in summertime type weather? If air is rushing into the core from upper floors, traveling down past the NPP and pushing out the base due to negative temperature/pressure differentials between inside/outside air, then what happens in fires where the air outside is much warmer than the air inside? Example: it is 95°F in July as an outside air temperature and inside is an average of 75°F on tenant floors. There is a 20 degree temperature imbalance in play and cooler air, being more dense, descends within the example tower. Let's say the fire is on floor 15 of a 40 story building, below the NPP. If the smoke becomes significant and enters the core area, something important will occur. Surely some of the smoke will rise due to the temperature of the heated gases from the fire itself. However, the air being channeled down from upper floors with the negative stack effect will also pull some of the smoke (and toxic gases) down BELOW the fire floor - sometimes many floors below the fire. Why would this be an important concern? Where is the staging floor? Typically located two floors below the fire, one can quickly see where this area can easily be compromised - especially since it is below the NPP, where air is being forced back out of internal shaftways and poke-throughs. This air pushing out onto lower floors can channel a fair amount of smoke onto the staging floor, contaminating it to the point of being untenable (especially if the HVAC system is turned off or not in "pressurization" mode for floors above and below the fire). Fire crews would then be forced to drop down and re-stage several floors further down, in turn moving equipment and relief crews further away from where they need to be. This includes Rapid Intervention Teams standing by “off air.” Losing your staging floor is not a recipe for success and this is why it may be wise to also take CO readings BELOW the fire floor in warm weather fires - especially on the staging floor, to ensure high-level readings of CO do not exist where there may not be a great deal of smoke present. This very real threat is easily overlooked in warm weather fires - is the staging floor safe to occupy? What about other tenant floors in this area where people may be maintaining a "defend in place" posture due to the fire being above them? This underscores the importance of tracking CO movement at various intervals above and below the fire area, in warm weather and cold weather incidents alike. In several high-rise fires in the U.S., the lobby command post was even lost due to the reverse stack effect pulling smoke down well below the fire floor and discharging it onto the lobby level – likely due to open elevator cabs standing by in Phase 1 recall mode and possibly open stairwell doors that discharged into the lobby. With a firm grasp of how air moves in winter within a high-rise building relative to temperature/pressure differentials, if you could choose where your fire would be the day you have to fight it, where would be the best option to have it occur? If it is at the base of the tower, smoke will get sucked into the core shafts and channeled up and out onto upper floors, so the best place to have the fire would be on an upper floor - not just because of the smoke not having far to go as it rises, but that the air is pushing OUT of the upper floor penetrations. This air movement will assist in keeping much of the smoke out of critical core chases since, in effect, it is naturally "pressurizing" the upper floors - and assisting in the containment of smoke spread. On a hot summer day, the descending cool interior air will be rushing out of the vertical shafts below the NPP and onto the lower level floors. This partial positive pressurization can be a major asset to smoke travel and containment, although it does provide one slight drawback – air flowing onto the fire floor will be at a greater rate and will feed the fire to some degree once the attack stair door is propped open (the same being true on upper floors in a cold weather fire). However, the benefits of smoke containment outweigh this factor. There may be though, some smoke migrating - due to possibly greater positive pressure from the fire itself - into the attack stair if no stair pressurization capability is present and the fire is close to the core. This smoke will likely be drawn downward to floors below (and sometimes well below) the fire in some proportion in these warm weather events. Newer, modern commercial office buildings typically possess stair (and sometimes elevator) pressurization systems, as well as at least floor pressurization capability during fires and possibly full smoke removal capability too for the fire floor. Such systems provide a new air balance and a shift in the NPP of the building and they tremendously assist in containing vertical smoke movement in the building during a working fire. I will explain these systems in greater detail in an upcoming article on HVAC systems for high-rise buildings. Some building codes in milder climates require high-rise buildings to have open vented elevator shafts for smoke purging. Elevators serving the alarm floor would normally recall to the ground floor and remain out of operation (for civilian use) during a fire. In some high-rise buildings, (heated) elevator pressurization systems have been installed (ie: the 52 story Manulife Centre, Toronto) to lower the NPP and reduce the significant stack effect, the air pressure on elevator doors (which can prevent doors from opening due to sideways pressure on doors and tracks) and vertical air movement from the lobby into the elevator shafts. It also allows the curbing of smoke into the shaft and the machinery room above during a fire. Cold weather – expect rapid smoke spread to upper floors from fires on lower floors. Hot weather – expect fires on lower floors to produce contamination to several floors below the fire – expect possible loss of staging floor and possibly even lobby command post. Most importantly, test for CO at designated floor intervals early and often. Track it as you would your own personnel. One other danger which is commonly overlooked is the threat of Hydrogen Cyanide (HCN) from the burning synthetic (foam, rubber) and natural (paper, wool) products present during the combustion process and the gas is even deadlier than CO. Since many hospitals may not have the capability of testing for HCN poisoning after a fatal fire, victims may be often pronounced dead from CO exposure when it could very well be more directly due to the very toxic gas – HCN. Newer firefighter gas sensors can test for and monitor the presence of HCN, in addition to CO, so it should be strongly considered to have Rapid Ascent Teams and other crews taking sample readings to check for high levels of both of these deadly gases throughout the fire fighting effort. It is a widely acceptable practice that when a fire breaks out in a high-rise building, the fire department should ensure that two floors above, the fire floor and two floors below are evacuated. The rest of the population should remain in place. This is also commonly taught in fire warden training as dictated by fire prevention bureau guidelines. Having a complete grasp on how far and how fast smoke (and deadly CO/HCN) can travel remote from the immediate fire area due to air imbalance and stack effect, can it not be argued that these parameters must be re-assessed very early into a given working incident? Empowered with the knowledge of how air travels within the confines of a multi-story building, you can now predict where the greatest threat from smoke spread will occur. If you can predict that, you can also predict and plan where the greatest threat exists relative to occupant survival – and where you must concentrate your rescue teams. CO monitoring, again, cannot be emphasized strongly enough. The next time you look at a 30 story building, look at it now as a living/breathing 30 story chimney. “Air balancing” – a topic that should be discussed in every high-rise department’s training regimen. Author's note: Very special thanks to Jack Smits – Managing Director of Engineering and Technical Services – Manulife Financial, Real Estate Division and Alan Reiss – former Director of the New York World Trade Center and current construction manager of the new Freedom Tower/One World Trade Center rebuilding project.